THE JEFFERSON HOUSE RESTAURANT- Baby Showers, Office, Retirement, Birthday, Graduation, and Anniversary Parties. Quality and price will reflect the same attitudes of the Management that have made the restaurant a "must" stop for Vacationers and Boaters on the lake during the Summer Months. Entertainment can be provided at a reasonable cost or you may make your own arrangements. Our flexibility or price and packages combined with our lakefront atmosphere and friendly service will result in an evening to remember at half the price of comparable packages. 3. 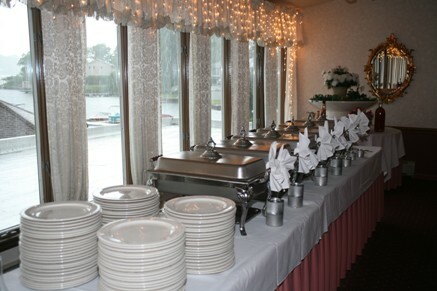 BUFFET – Served with Garden Salad, and Fresh Rolls. 4 HOT ENTREES + a choice of potato, and Mixed Vegetable. Entrée Options: Meatballs, Sausage and Peppers, Chicken Marsala, Chicken Francese, Penne with Vodka Sauce or Bolognese, Baked Chicken, and Baked Ziti. Eggplant Rollatini, Macaroni & Cheese, Ravioli w/ Vodka Sauce and Fried Chicken. GREATER). A 3% SURCHARGE WILL BE APPLIED TO PAYMENTS MADE WITH CREDIT CARD. Prices, availability, and choices are subject to change. Limitations and restrictions may apply. Call the restaurant to obtain the latest pricing, choices, events, and availability.